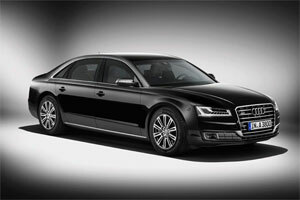 The drives become securer, as Audi launches the new model of A8 L Security. Positioned as high-security version, this luxury sedan provides a much safer driving experience. This armored version of A8 is equipped with gears and components allowing optimum security and protection for passengers. Built with the patented emergency exit system, the doors can be easily detached from the body just with a single push of a button, while another press of button activates the built-in fire extinguisher system. The emergency fresh air system averts the intrusion of toxic gases by squirting in fresh and quality breathing air. Apart from these, A8 L Security encompasses other minor security systems, which make it the best sanctuary drive. All these features are optional and are added, as required by the customer. Even with the implantation of extra security apparatuses, the vehicle is able to sustain its styling and design, both internally and externally. The front seats offer various adjustment options and electrically adjustable rear seats give a comfortable seating experience in this luxury drive. Available color schemes in upholstery create an elegant inner environment. On the outer, Audi A8 L Security upholds the traditional styling with minor modifications from the previous version, including flatter LED headlights. As anticipated, the powertrain is also upgraded from the previous one with a 4.0 liter eight-cylinder TSFI engine, capable of generating 435 horsepower. The recorded time for accelerating from 0 to 100 km/h is 7.5 seconds, while the fuel economy is modest with 11 liters per 100 kilometers. The high-performance version of the same model is loaded with a 6.0 liter twelve-cylinder W12 FSI engine with Euro 6 emission standard. Such powerful machine can produce up to 500 hp. It can discharge to 100 km/h in just 7.1 seconds. Apart from these, Audi A8 L Security encompasses several other privileged features that make it one of the best in the league. Although the prices and availability information is yet to be announced, I expect to see it any time in the first quarter. Is This the End of the WRX STi?